UN High Commissioner for Human Rights and OHCHR head Michelle Bachelet stressed that a full examination of, and accountability for, human rights violations committed against Mr. Khashoggi be conducted. The journalist disappeared from the Saudi consulate in Istanbul on 2 October 2018. According to news reports, Saudi officials now admit that he was killed inside the embassy by a team of agents sent from Riyadh, although his body has yet to be recovered. “For an investigation to be carried out free of any appearance of political considerations, the involvement of international experts, with full access to evidence and witnesses, would be highly desirable,” she stated. She called on Turkish and Saudi authorities to cooperate in ensuring that the truth be revealed. 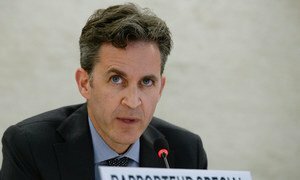 The Special Rapporteur on the promotion and protection of the right to freedom of opinion and expression David Kaye said he was “very disappointed” that Member States have so far failed to back calls for an independent international investigation into the murder.